This fun site generates ridiculous creative job titles, will yours appear? The creative industries have spawned some suitably creative job titles. And while some roles are given descriptive and impressive names, there are, admittedly, a few professional monikers that border on the bizarre. Words such as guru, unicorn, and thought leader can be found on the creative resumes and LinkedIn pages of designers, perhaps to the bafflement of non-artsy folk. And now, Pseudo Design Titles is here to lovingly poke fun at this ludicrous lexicon. 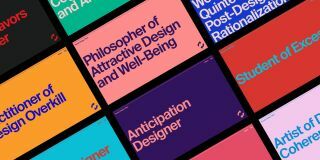 Created by designers Xtian Miller and Boris Crowther, the site describes itself as "a satirical title generator for designers seeking a title apart from other designers." So if you're looking for a new job title to spice up your CV, simply head over to Pseudo Design Titles and let the random role generator work its magic. New titles are created when you hit the space bar, and the more you do it, the more surreal they become. Check out some of our favourites by clicking left to right in the gallery below. What are your three design wishes? Inspired by other online publications that have taken a friendly swipe at corporate creative culture, including The Truth About Design Titles and the Silicon Valley Job Generator, Pseudo Design Titles is clearly a tongue in cheek project created by people who have more than a bit of industry self-awareness. So don't be too offended if by some amazing coincidence a title similar to yours is conjured up. It's just a bit of fun! And if you do want to update your business card to reflect your new role, then check out our post on business card templates.